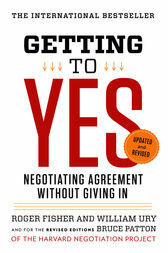 Getting to Yes has helped millions of people learn a better way to negotiate. One of the primary business texts of the modern era, it is based on the work of the Harvard Negotiation Project, a group that deals with all levels of negotiation and conflict resolution. Getting to Yes offers a proven, step-by-step strategy for coming to mutually acceptable agreements in every sort of conflict. Thoroughly updated and revised, it offers readers a straight- forward, universally applicable method for negotiating personal and professional disputes without getting angry-or getting taken. Roger Fisher is the Samuel Williston Professor of Law Emeritus and director emeritus of the Harvard Negotiation Project. William Ury cofounded the Harvard Negotiation Project and is the award-winning author of several books on negotiation. Bruce Patton is cofounder and Distinguished Fellow of the Harvard Negotiation Project and the author of Difficult Conversations, a New York Times bestseller.